We are almost through Nevada, enroute to Cedar City, Utah where we’ll be spending the night. It’s 7:30 PM, dark and a two lane road. Thankfully, my iPad is backlit and I won’t need Internet connection, or any connection for that matter, until we reach the hotel. We left my parents and the bustling Bay Area this morning. But once we reached the Sierra Nevada foothills and started climbing through the Stanislaus National Forest, our day of contrasts began. The Sierras were stunning! I grew up camping in state and national parks with lots of pine and redwood trees and feel very connected the the mountains. I don’t think anything compares to Yosemite. The massive granite rock formations, rivers, lakes, and meadows are truly national treasures, evidenced by all the full campsites and parking at every trail head and picnic area. Yosemite and I have a special relationship. My orthopedic journey began as a result of a backpacking trip in Yosemite. That was 41 years ago(! ), long before MRIs and orthoscopic surgery. Thankfully, orthopedic technology has advanced significantly in the last 40 years and I now have stainless steel and titanium knees and ankle for a new hiking experience! We planned to get out at Tuolomne Meadows for a picnic, but couldn’t find a place to park. We drove on thoroughly basking in the beauty of creation. I was glad I wasn’t driving so I could immerse myself in the spectacular vistas! (My chauffeur husband said he still enjoyed the views). 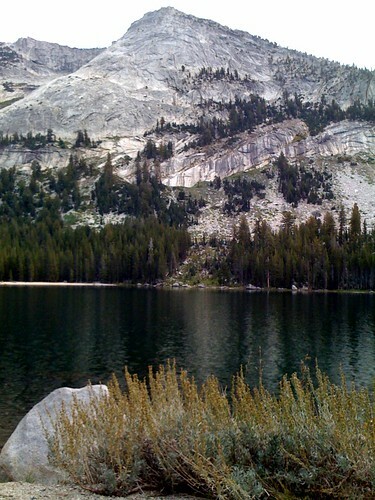 Once we summited Tioga Pass (elevation 9945), and started down the winding road on the eastern side of the Sierras. We knew Nevada was close. No trees! None! Lots of scrub, however, and rock. I think Nevada takes advatange of their open space and builds the straightest, two-lane roads as far as they can! The ONLY time we were on a curvy road was when we were going through mountains, which Nevada does have, believe it or not. We came prepared with our tin foil hats for The Extraterrestial Highway and Area 51, but only saw terrestrial beasts…the four-legged, open range variety…cows. Of course I was driving during this stint. Nothing like going 80 mph and watching for cows crossing the road! The other noticeable contrast was going from the tech capital of the universe, Silicon Valley (really known as Santa Clara Valley to us natives), where connectivity is also capital, to No Service. That’s right. No cell service through the entire state of Nevada! There weren’t very many other cars and very few places to stop for gas either! I told my passenger husband it was a good thing I was such a good driver because if we were in an accident or had an emergency, the coyotes and buzzards would have us picked clean before anyone ever happened upon us! We just crossed into Utah! Since the rough roads are making this a less-than-pleasurable-typing-on-my-iPad-experience, I’ll spare you my further ramblings. Tomorrow is the Arches National Park on the way to Cortez, Colorado. (We’re taking the scenic route to Guymon, Oklahoma where we’ll be spending a few days with my husband’s family). What a blessing to be traveling through such beautiful and geologically diverse country! Stay tuned! The picture at the beginning of this post is Tenaya Lake in Yosemite. It was taken from the car with my iPhone. You’re right about Nevada. The afternoon sun really pulled out the colors in the rock mountains. And we saw the most stunning rainbow that came all the way to the ground! There was no place to pull off (not that there were any other cars), so we didn’t try getting a picture.